The Basilica of Santa Maria is the oldest church in the city of Alicante. It dates back to the 14th century. It was built atop the ruins of Alicante’s biggest mosque. An architecturally stunning building, highlights of it include the doorway which has the image of the Virgin Mary created by sculptor Juan Bautista Borja. 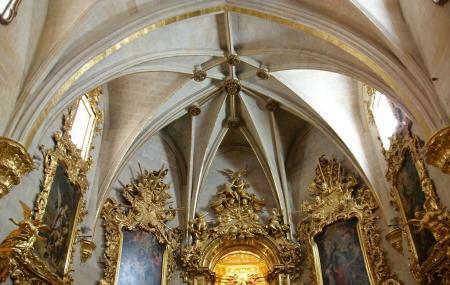 Within the church, you will find an 18th century rococo main altar and the Bautismo, Inmaculada and Comunion chapels. You will also find a Valencian baroque organ from the year 1653. It is an active place of worship. Please maintain the tranquillity of the place. Timings vary as per church mass. Mass is usually conducted at 9:00 am and 6:30 pm Plan your visit accordingly. How popular is Basilica Of Santa Maria? People normally club together Pupuce Plage and Concatedral De San Nicolas Or Saint Nicolas Cathedral while planning their visit to Basilica Of Santa Maria. Beautiful historical church, both inside and out. Ornate baroque decorations. Balcony inside ideal for choir or individual singers. Square outside ideal for gathering congregation. Oldest church of Alicante. Lovely facade. Interiors were pleasant although nothing spectacular. Most interesting was however the 2 canon balls from 18th or 19th century seaside attacks atill embedded on one of the outside walls! From our hotel room we looked right down onto the Basilica and it was quite a sight. With the window open you could sometimes hear someone praying or perhaps later a rowdy group of young students. It was such a sight. I could see from our room that someone had tossed a sneaker up onto the ledge so look at my pic. Inside was lovely and there was actually a service happening when we entered. Take your time and soak up everything g here as it is quite majestic s Wheelchair friendly. Kid friendly. It was closed during our visit. A beautiful and monumental building.